Happy Halloween! What's a better way to spend the most frightful day of the year than watching Japanese children get murdered and ripped to shreds by vengeful spirits? Umm… eating candy? Yeah, I'd rather do that. Corpse Party isn't really what I'm into. Outside of perhaps Battle Royale, slasher movies, cultish macabre, and the violent murder of teenagers has never been my ideal form of entertainment. I can shoot zombies, aliens, and goblins in the head until I'm blue in the face, but the grisly death of youths, especially when left in the hands of Japanese storytellers, has always put me in the wrong state of mind. However, as a connoisseur of classic video games and a fan of the Japanese video game history, Corpse Party has always been one of my largest, most obvious blank spots. To say this game has a reputation would be a huge understatement, and it has become quite the phenomenon in the 20 years since it was first made. For those who don't know, Corpse Party was first made by a gamer by the name of Makoto Kedōin back in 1996 using RPG Maker. It gathered a fanbase on the back channels of the early Internet, and since 2008, enough support over the years led it to become a franchise on its own: remakes, sequels, ports, and even television and manga series. From its humble beginning as an indie game to a full-fledged franchise, it's the kind of success all cult-classics of its ilk want to see. The only difference is that it's 20 years old, dating back long before even Cave Story! With this new Nintendo 3DS port, recently localized by XSEED, I finally got to dip my toes into the legend of Corpse Party, and I'm finding it to be a mixed bag. The game and its many iterations have never really been known for their quality gameplay, but rather, fans consume them for their atmosphere, story, and characters. Here, absolutely, the game is a success. Corpse Party stars a group of high school friends trapped away in a haunted elementary school, and they struggle to survive and find a way out. Some of them meet horrible deaths along the way, and one wrong turn or a break in logic can lead to a bloody "Wrong End." The worst are the frightening blue ghosts lurking around every corner, ready to rob the defenseless kids of their lives. All these kids want? To escape! 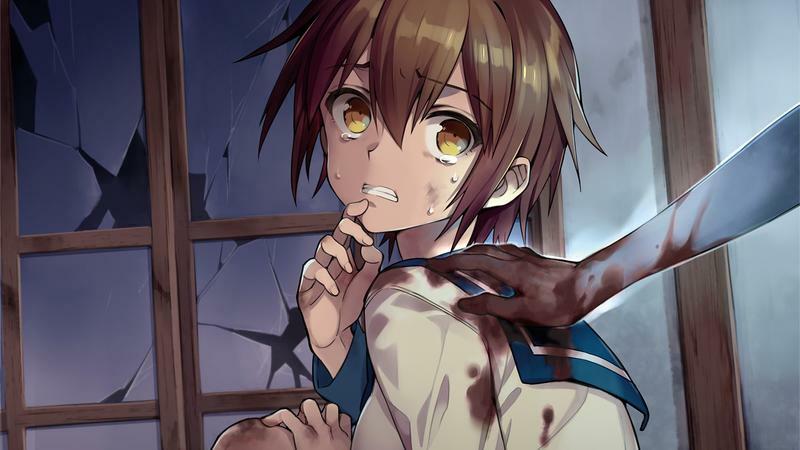 Corpse Party has no problem setting up its relatively simple premise. Most of the characters are likable, although I think the writers might have a problem identifying the ages of a few of them. Do we really know a 14-year-old girl who uses the word "potty?" Japan and its inability to wrap its brain around the concept of "age" in anime characters flares up all over this game. Still, it's forgivable and hardly game-breaking, especially if you've been indoctrinated with enough anime storytelling over the years. Characters have believable relationships, many of them react to situations as you would expect, and nothing falls too far out of place. The 16-bit graphics have a nice touch, especially for fans of that old style like myself, and the retro tunes, whether it's the spooky mood-setting kind or the surprisingly upbeat action music, get the job done. While playing Corpse Party at 1AM in the pitch black provides a surprising amount of frights, I struggle to call it a good adventure game. With all the revisions and budgetary gains that these loyal remakes have, at its heart, it's still a game designed by an amateur with one of gaming's simplest pieces of game-making software. That 16-bit influence shines on a bit too heavily, because even in the cramped, haunted school, certain points in the story will lead to a lot of mindless wandering. Searching shelves for invisible items that might be there, scouring the hallways for an object that might have randomly appeared in an unrelated spot, and searching to complete objectives that aren't always clear. Corpse Party keeps up its end of the bargain with the frights, but your patience might be tested at a few points while uncovering them. And the modernity of this port too must also be called into question. In 2016, we want to be able to get back to the game as quickly as possible if we fail. However, Corpse Party lacks the ability to skip cutscenes! If you get a Wrong End, you'll be forced to suffer through walls of text and squeaky Japanese voice acting for a second and possibly third time! There's also not that much to it on a basic level. Characters walk around, pick up an item here and there, and use it to start a cutscene. Puzzles are kept to a bare minimum, combat boils down to tricking the AI to walk into a wall and trapping it there while you safely walk by. The decisions between Wrong End don't come as the result of your skill. You're most likely going to get a Wrong End because you forgot to pick up an unknown key from a desk and forgot to enter an unrelated room before enacting an entirely separate cutscene. You see what I'm getting at? It's not the best adventure game in the world, and if you play it as such, you're going to be a little disappointed. It's like Persona, except with extreme murder! At this point, I think Corpse Party can be mostly forgiven for its shortcomings. It's not a very well designed game, but when it comes to telling a story, creating a setting, and dropping likable characters into its drama, it's really solid. Mysteries spring from every corner, paranoia and fear lie within each face you bump into, and all of the characters have a surprisingly decent backstory. Plus, each chapter can be beaten in about an hour, so it's not like the game requires that much of a commitment. Sadly, the most joy to get out of the game, aside from the following the story path, comes from purposefully killing off these characters or finding ways to make them suffer. It's like Roger Wilco from the Space Quest games, only instead of being humorously friend by alien lasers or eaten by disgusting space spiders, in Corpse Party a trio of ghosts force a girl to swallow a pair of scissors that tear apart her insides. And I also recommend Corpse Party for those interested in its history. It's a title where the reputation is simply too large for the game anymore, but for those who love Japanese video games, especially indie games, it's become required playing at this point. If that's your motivation, though, I think the original version would be the most authentic experience. This Nintendo 3DS port is good, but the best I can say about it is that it turned me on to looking for the real, original, free game. Disclaimer: We were provided a copy of Corpse Party for the Nintendo 3DS by XSEED, and we played four hours of the campaign before writing this review.